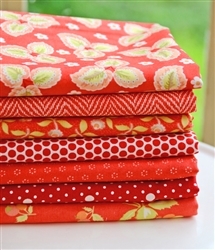 These classic tomato reds mixed in with some classic reds are just the perfect addition to any project. Build your stash with these awesome prints or work them into any fall or Christmas project! Bundle includes a wonderful variety of red fabrics from Hazel & Plum mixed with other favorites!